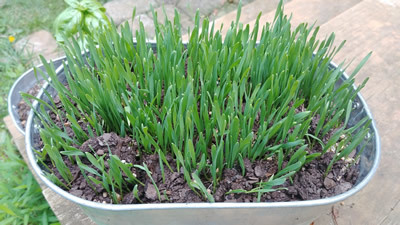 Planting in galvanized steel containers is superb for flowers, small indoor herb gardens, and whole vegetable gardens. Galvanized steel containers are available in all shapes and sizes, durable, long lasting, lightweight, and arrive ready for planting. 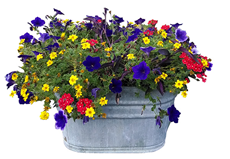 Planting containers must withstand the presence of corrosive soil and water 24/7. Because galvanized steel is steel has a coat of zinc to prevent rusting, it is exceptionally good for planting in. You can read more about the benefits and hard-wearing properties of zinc plated steel. Related: Does galvanized steel rust? 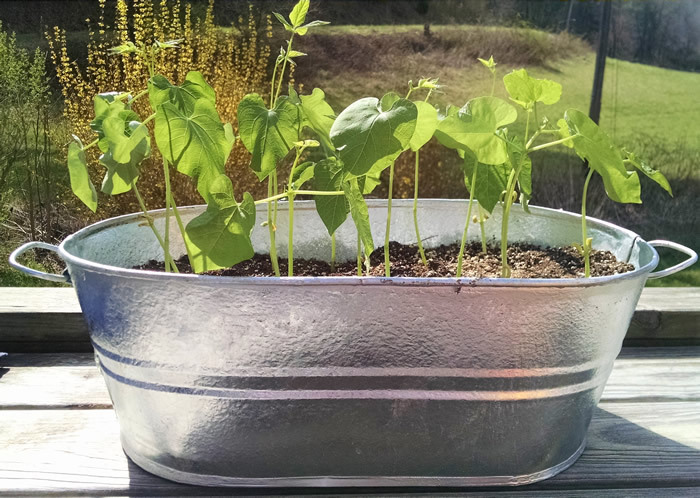 Click here to jump to the biggest hack for planting in galvanized steel containers inside. These small galvanized buckets can be ordered with an optional plastic liner. The liner is handy to contain water within the small galvanized buckets. 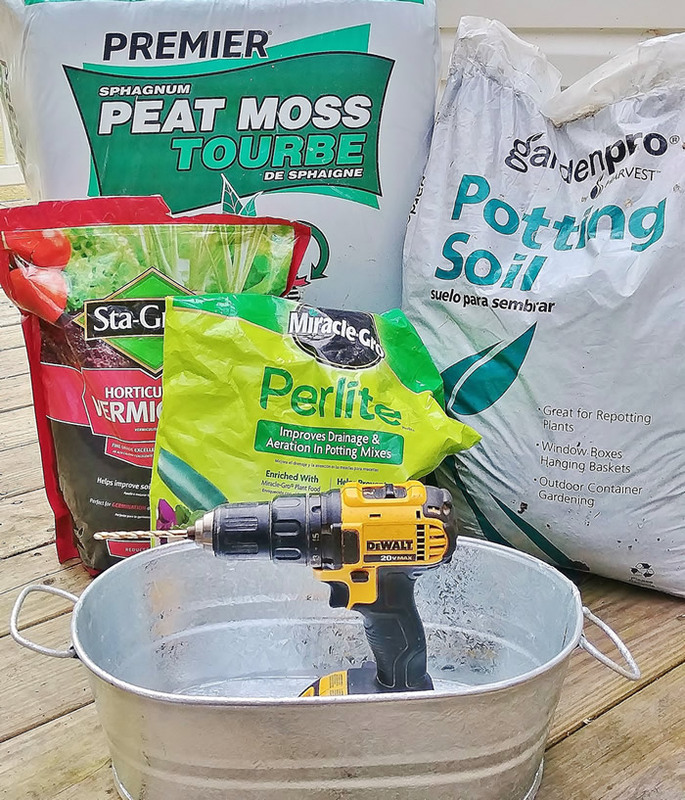 If you want to start lots of seeds and make sure water is draining from EVERY small galvanized planter pail, drill holes all the way through the liner and the bucket. Excess water is collected in a galvanized metal tray to protect indoor furnishings. Try a bead of silicone calk along the folded ends of the tray to maximize how long the tray remains watertight throughout the seasons. 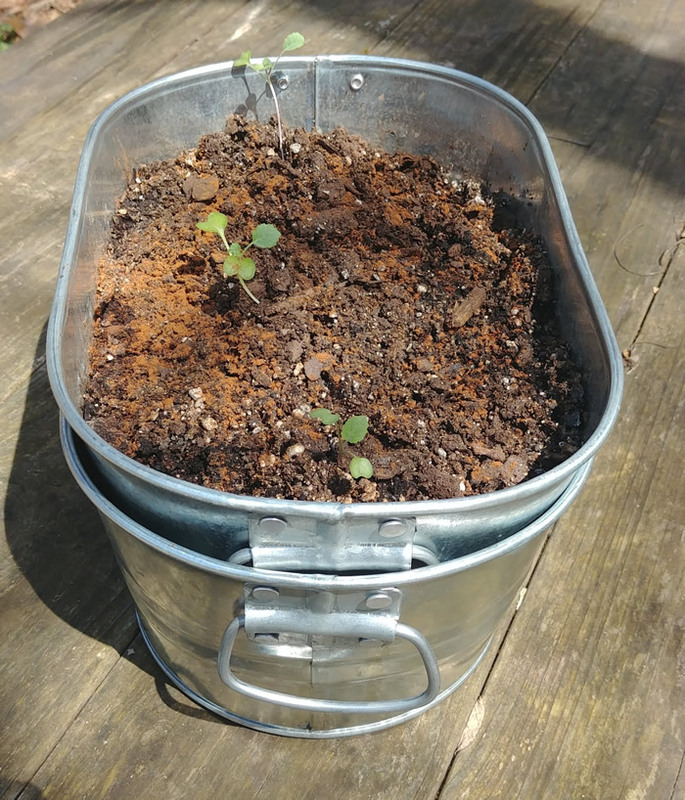 Using a try under your small galvanized pail seed planters is optional. 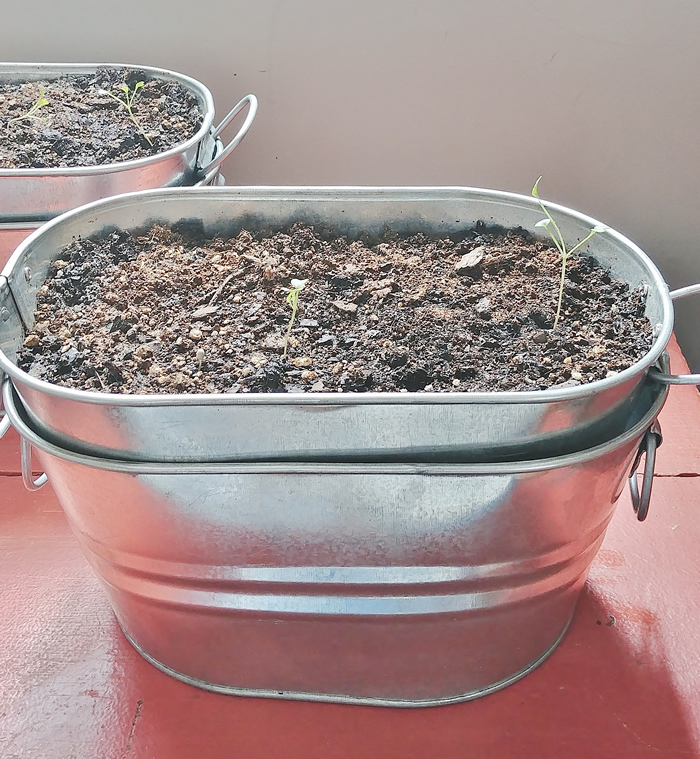 Seeds can successfully start and grow in simple galvanized pails and liners to help drainage. 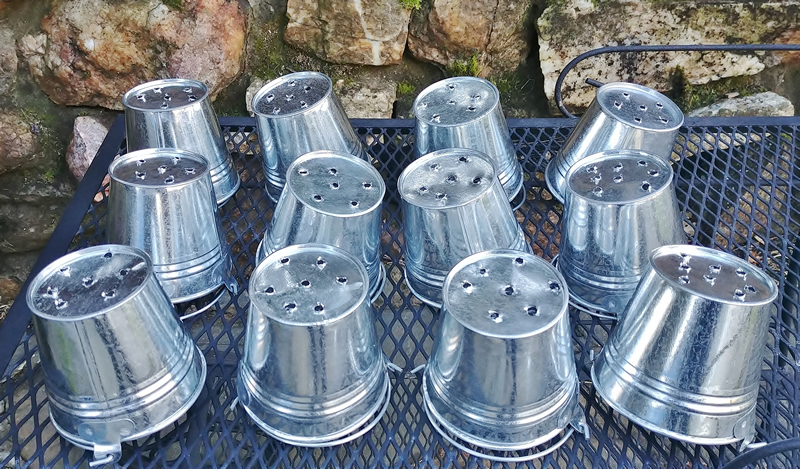 Use the drill and drill bit to create drainage holes in the bottom of the tiny pails. These pails are very easy to drill through and holes can be added to more than one bucket at at time when they are stacked. Make sure you add enough holes to let water drain. Step 2 - Wash the buckets, liners and tray with soap and water. 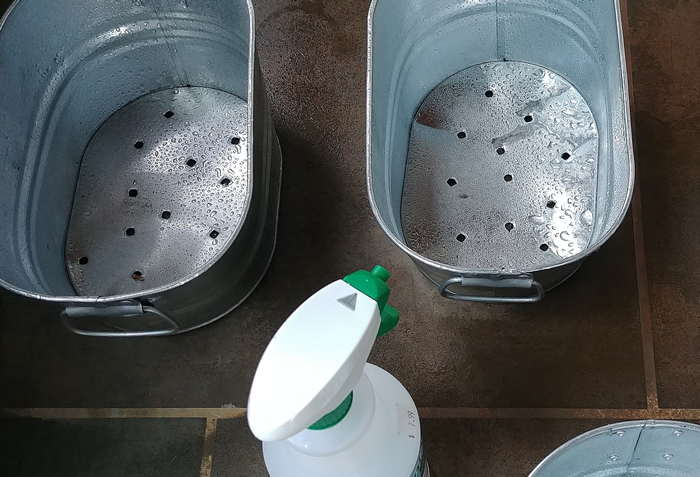 Cleaning the pots for your seeds and plants is always a good practice. Washing eliminates dirt, possible mold spore, and other microparticles that may be present from shipping. To ensure your seeds and transplants get off to a healthy start it is best practice to wash your pails, tubs, buckets and pots for planting. Step 3 - Prepare seed starting mix. 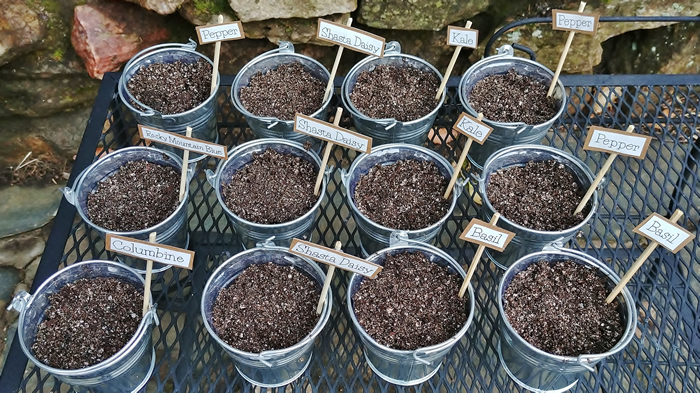 This tried and true seed starting mix is perfect for starting all kinds of seeds. 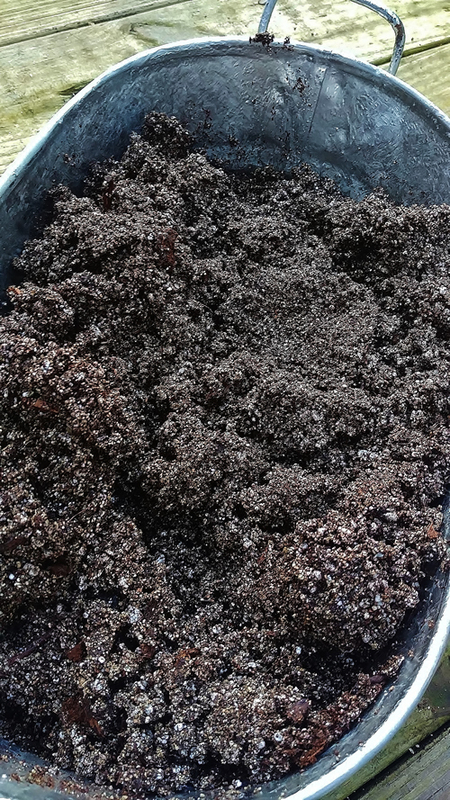 It's a simple 1:1:1 ratio of peat moss, vermiculite, and perlite mixed together and moisioned. 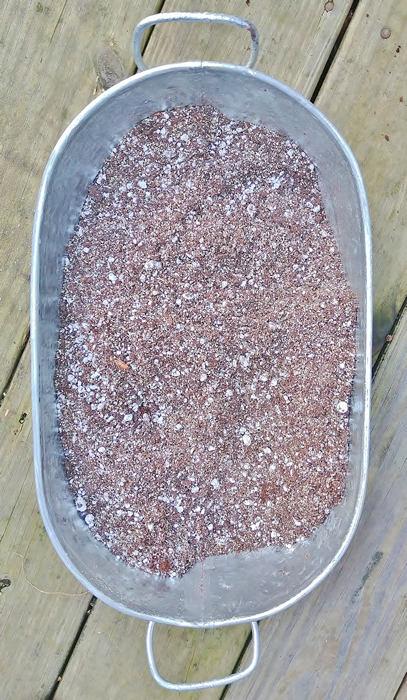 Measure equal parts of peat moss, vermiculite, and perlite into a container and mix (as pictured below). Once all three ingredients have been added mix them together. Add water and mix until seed starting mix is fully hydrated but not dripping wet. 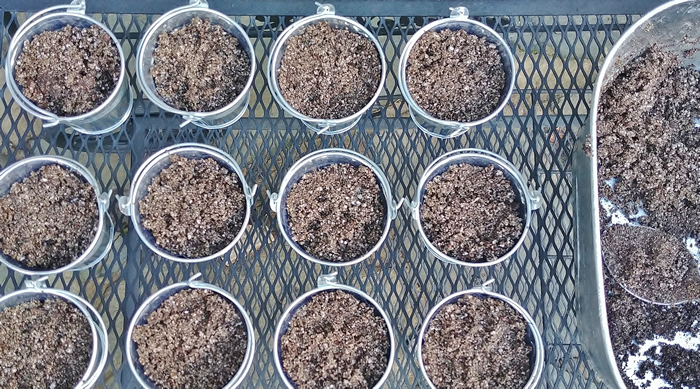 Step 4 - Scoop hydrated seed starting mix into small galvanized seed planters. Step 6 - Spray with misting water bottle everyday or every other day until seeds are ready to be transplanted. 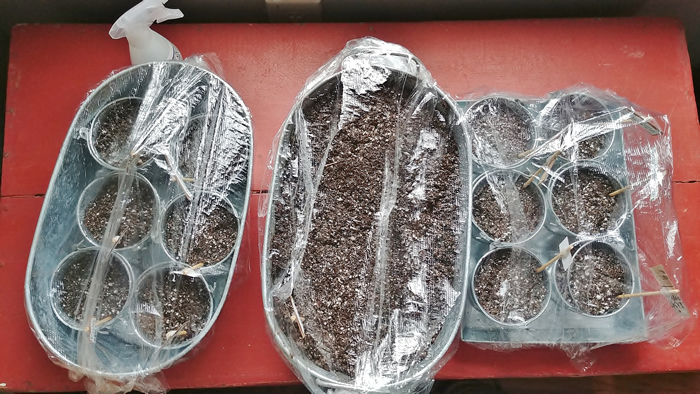 Cover seeds with plastic wrap to encourage sprouting. Happy planting! 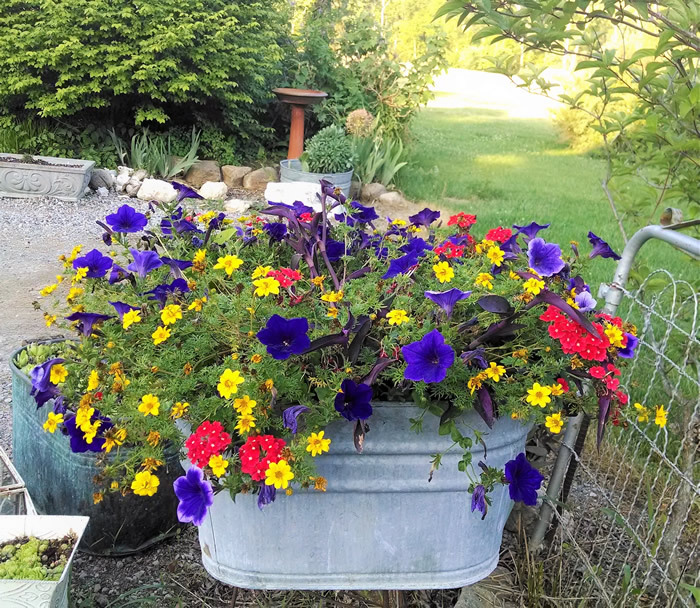 The biggest life hack for growing plants in galvanized steel pails and wash tubs: Stack two of the same type together to create your galvanized planter. 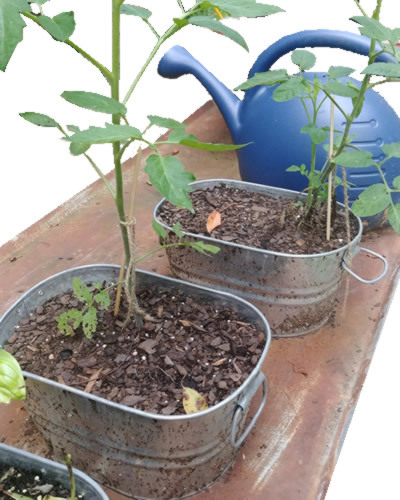 The bottom serves as a drainage tray while the top galvanized bucket or tub serves as the plant's pot. 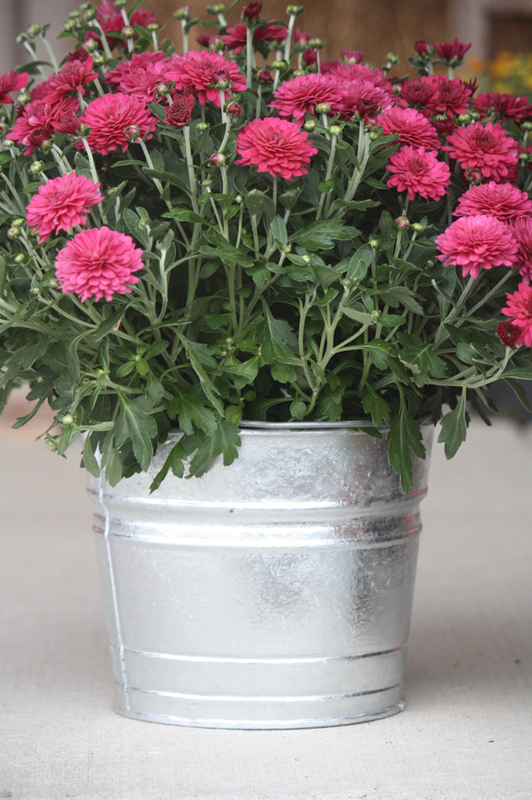 It is so incredibly simple to stack galvanized tubs and buckets to create indoor well-drained and leak-free galvanized planters! Holes are made in the top galvanized container to allow adequate water drainage. The bottom galvanized container allows water to drain from top without damaging furnishing or floors inside your home. It's a good idea to use silicone calk (and let it dry before coming into contact with water) to reinforce the water-holding capacity of the container's interior seams. 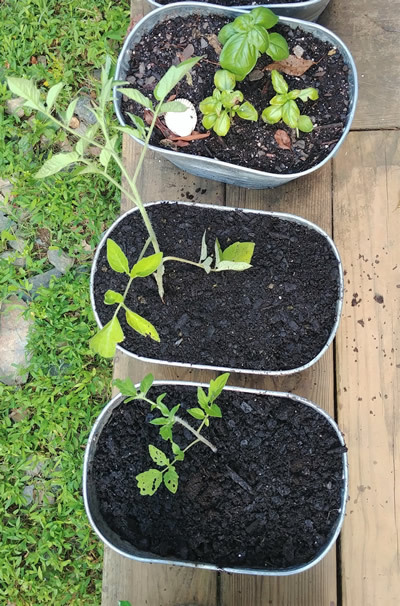 Unstack the containers to poor out extra water. These stacked galvanized planters can be placed on a table or floor or the bottom tub's sturdy side handles can hang from hooks or rope. 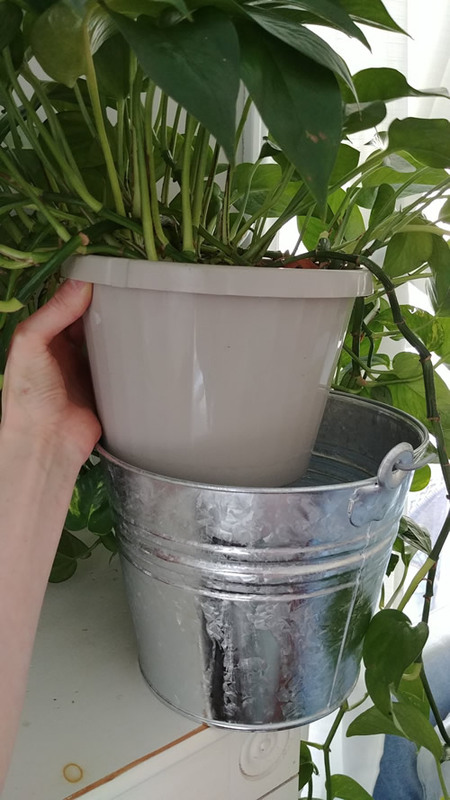 Alternatively, if you already have a plastic or ceramic pot you would like to pot your plant in, measure the diameter and order a galvanized bucket it can slide into. This achieves the rustic galvanized container look with little effort. Step 1: Select the shape and size of your containers. Select container width and depth based on the type of herbs, vegetables and flowers you wish to grow inside. 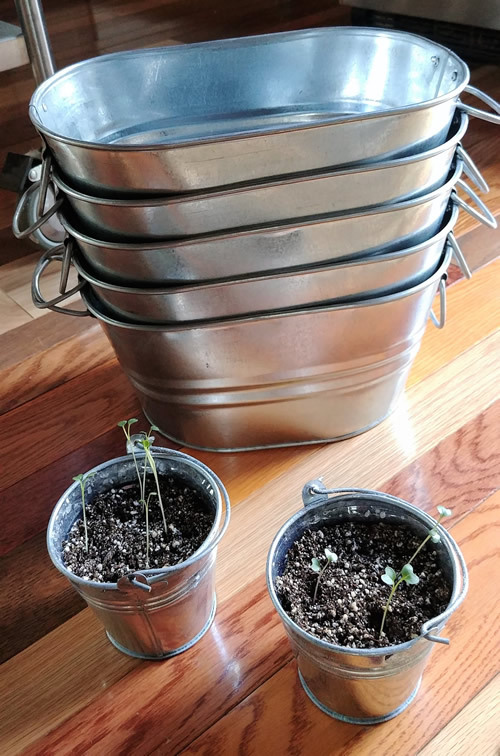 For greens, flowers, and shallow-rooted herbs like basil, lettuce, arugula, kale, and wheatgrass select a container at least 7" deep (like the 5 quart galvanized bucket pictured left below) or larger. 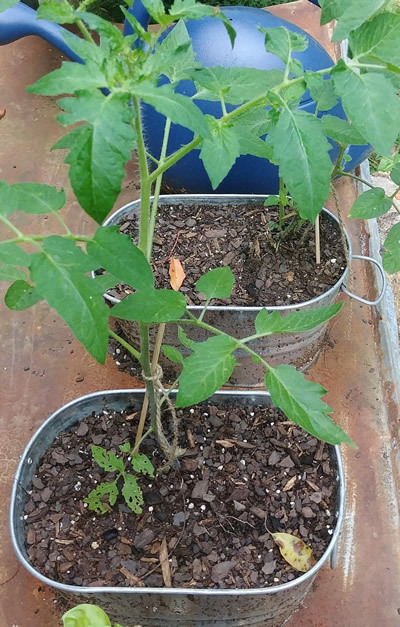 For deep rooted vegetables like tomatoes, beans, and peppers go deeper to 10" (like this 14 quart galvanized bucket). 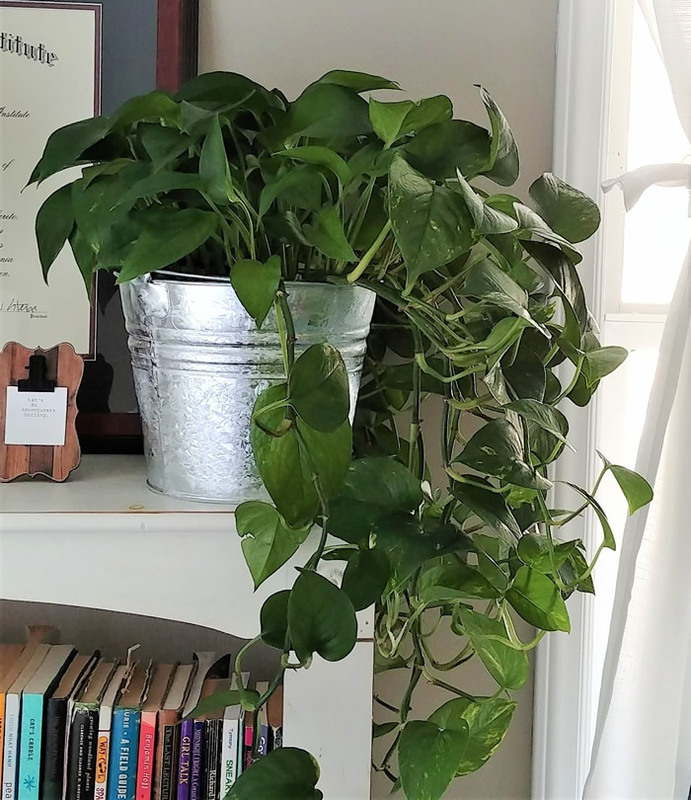 There are many large galvanized wash tubs for planting, but indoor container plants are generally are of the small and movable variety. 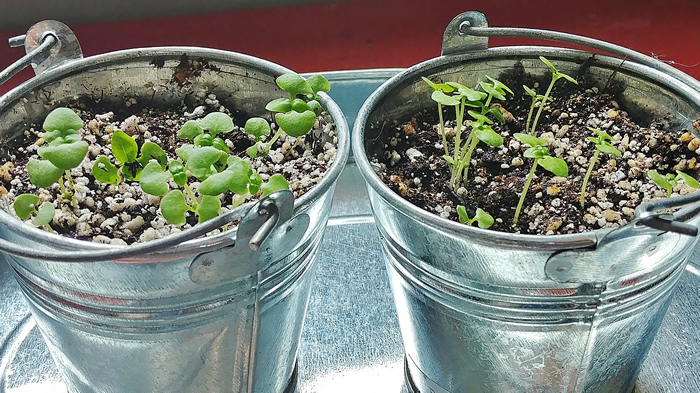 These three tubs are a manageable size for cute indoor planting (1 gallon, 2 gallon, 4 gallon). The following galvanized garden containers were created using our 1 gallon electro galvanized tub. When filled with soil they're light enough to carry, durable enough to last many seasons, and big enough to accommodate two or three plants. 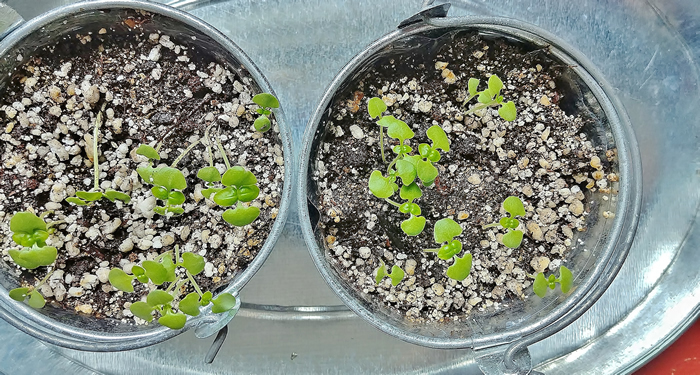 We used these 1 gallon galvanized planters to transplant the kale we sprouted earlier in small galvanized seed starting pails. Step Two: Make drainage holes. 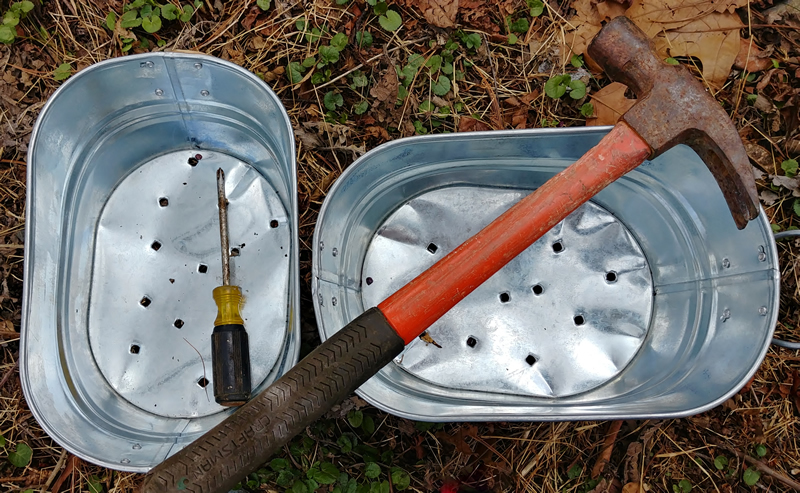 In our post about starting seeds in galvanized metal we discussed using a drill to create holes in the galvanized metal planters. If you are without a drill in a pinch, you can use a hammer and a screwdriver to create holes. Hit the screw driver though the bottom of the planter with a hammer to create drainage holes. This is best done over a floor or outside area that cannot be damaged by the screwdriver. This method will dent the bottom of your metal planter, as shown in the picture below. 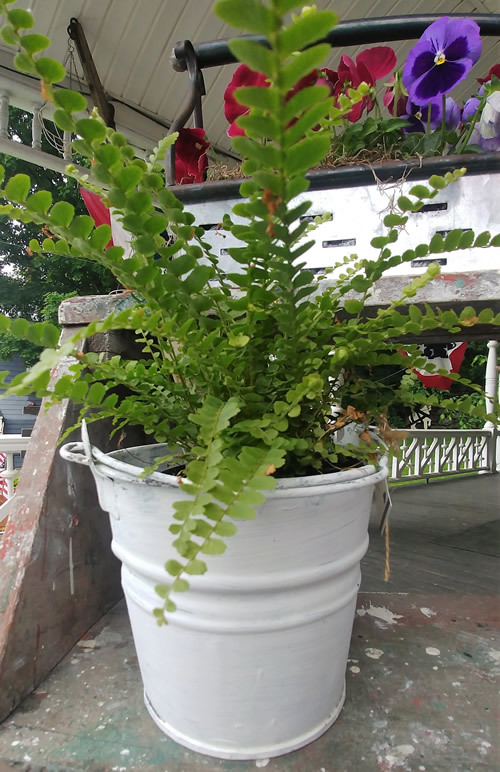 To make a galvanized planter resist corrosion for as long as possible - drainage holes should be made with a drill to avoid damage to the galvanized metal. Read more about the rate of galvanized steel corrosion. 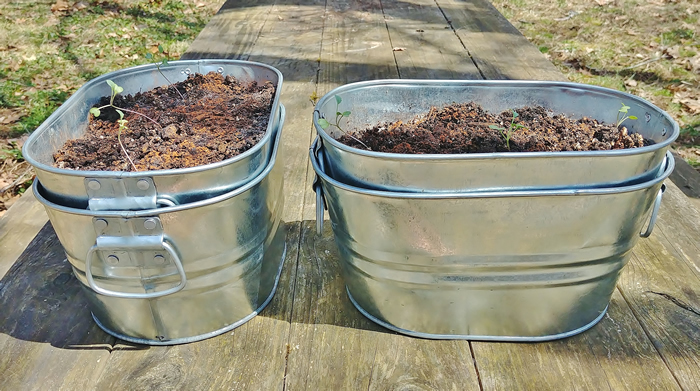 Step Three: Don't forget to wash the galvanized metal before you plant! Even if your galvanized containers are brand new they should still be cleaned. They were stored and shipped on pallets in and out of warehouses. 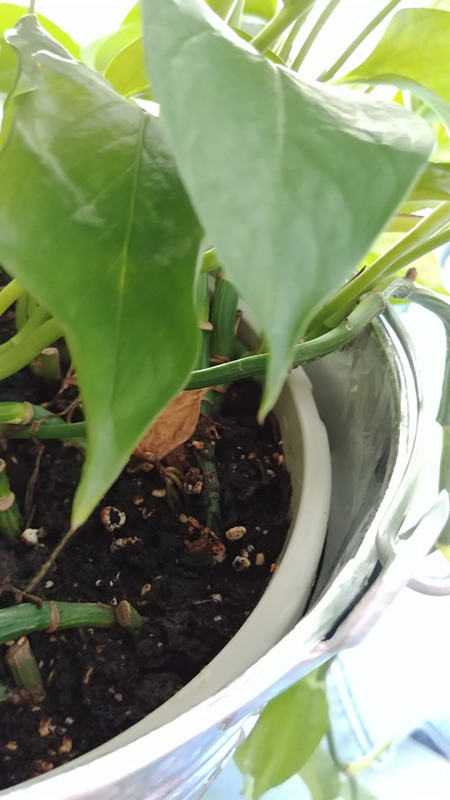 It's a good idea to eliminate any possible containanates (mold, dirt, bacteria, etc) thereby eradicating any risk of contaminating your potted plants. Be sure to clean both the top planter and bottom drainage container. 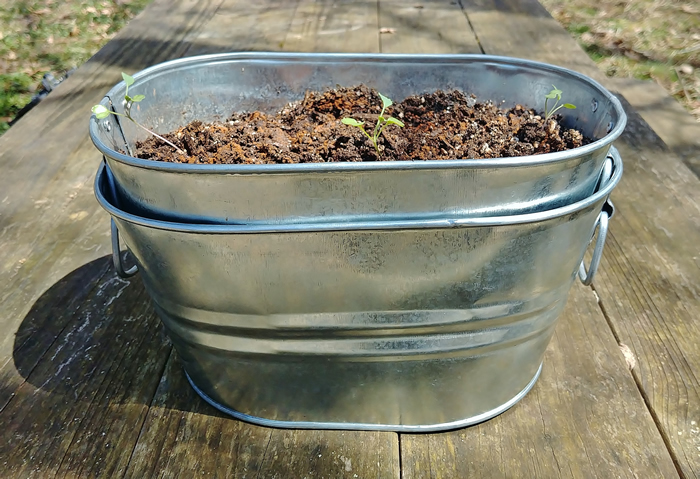 It is acceptable to use soap and water to clean galvanized planters. 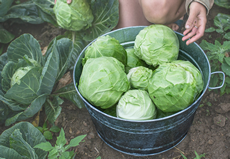 Another popular way to sterilize garden containers is to thoroughly spray them with a solution of 1 liter of water mixed with 1 tablespoon of bleach before drying with a clean towel. Since wet soil goes into the containers next it is not important that your galvanized planters be completely dry before filling the interior. Just be sure to effectively remove soap and bleach. 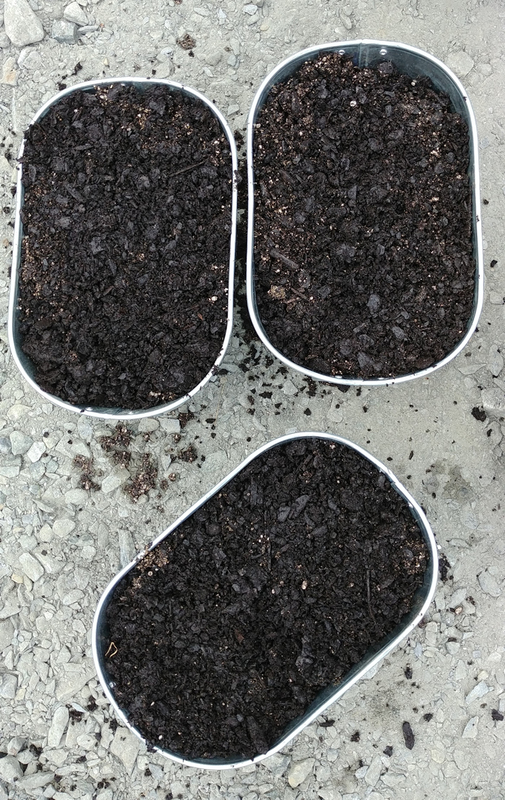 Step Four: Fill the interior of your galvanized metal planter with drainage material (rocks, wood chips) and soil. 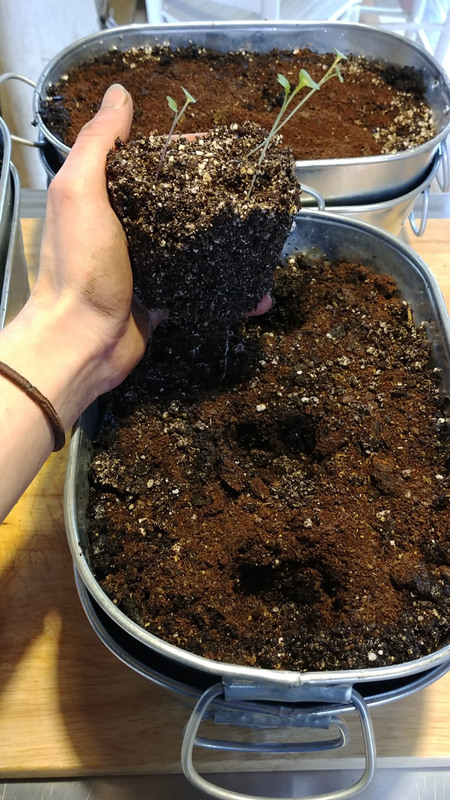 To support more efficient drainage, in addition to drilling drainage holes, add a few inches of rocks, stones, and wood chips to cover the planter bottom. 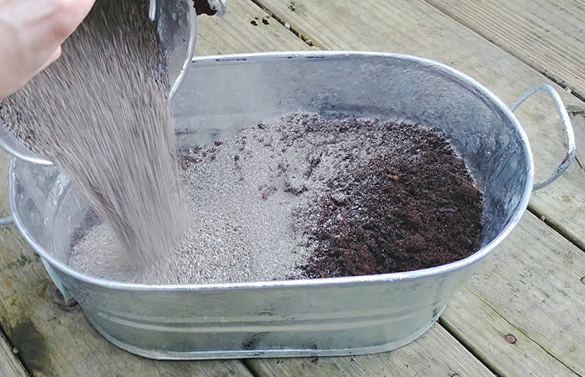 Below are a few recipe variations for potting soil with good drainage and adequate water holding capacity. Otherwise, the growing material for the tub can be a commercial potting mix. 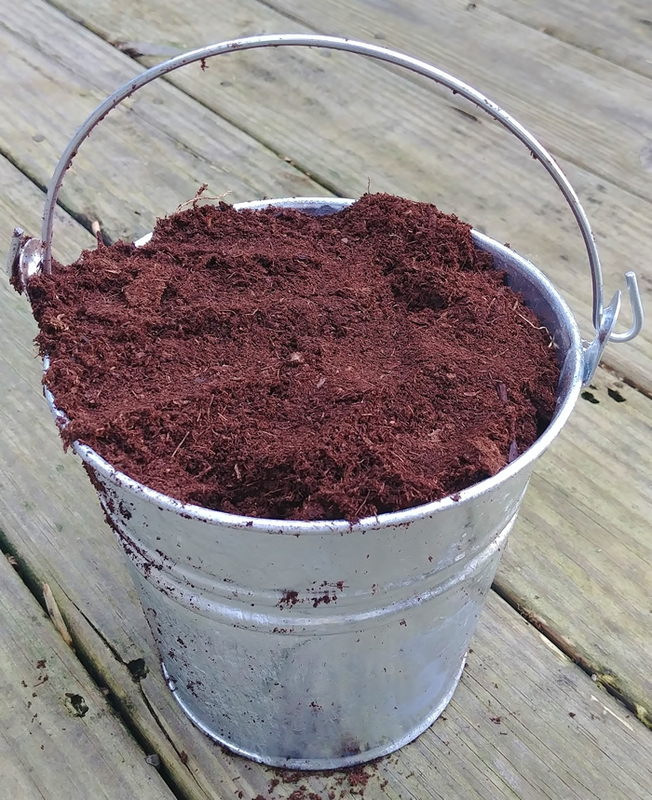 The potting soil mix should be thoroughly mixed and moistened with clean water. 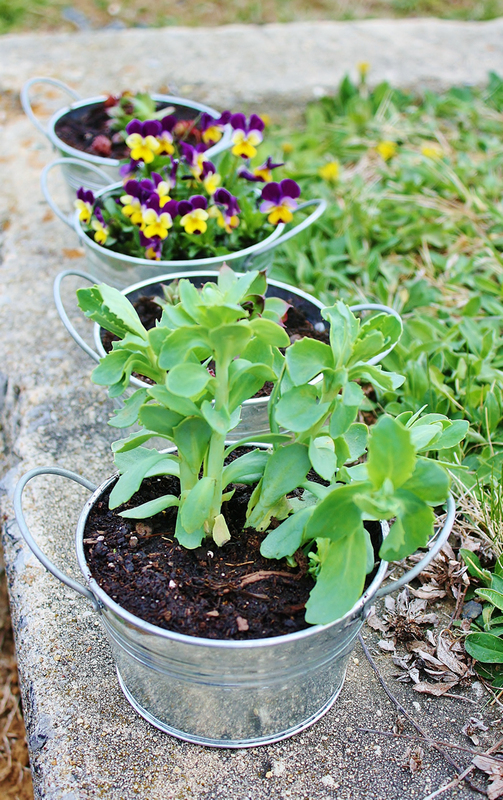 When the soil is ready fill up your galvanized planters with potting mix. 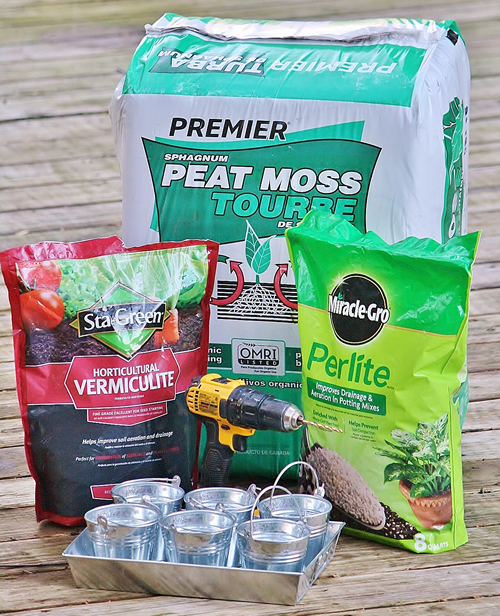 Are you looking for an easy way to get your garden started? Galvanized tubs make handy raised beds and they are pretty cool looking too. Best of all, this DIY project is one you can easily complete over a weekend. A galvanized raised bed can be large or small - it's a garden area you don't have to bend over for! 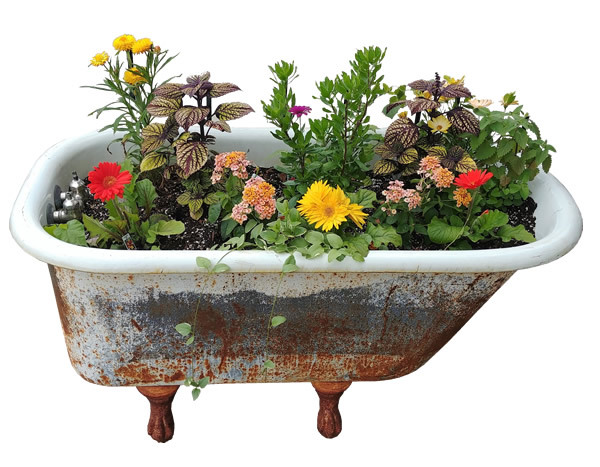 Available in a variety of shapes and sizes, galvanized wash tub planters require no assembly (other than drilling drainage holes in the bottom) and sit at just the right height for tending vegetables or flowers. After you set up your first raised galvanized garden planter you will adore and relish how easy they are to maintain. You may start to look at ground plants as a prehistoric and painful ranking of the earth. "Why didn't I know about this before?!" you will demand with baffled expressions. Eventually, you'll probably decide with laughter never again to bend over to pull weeds to expertly maintain a bounty of biodiverse food and flowers. If you laugh your way to dying your hair green and find yourself cackling at the morning sunrise - you've gone too far! While the up-front cost of large wash tub planters is often greater than wooden raised beds, they do offer some significant advantages, including life span, protection against meddlesome foreign roots and little tunneling mammals, and ease of maintenance and weeding. It is easy to feel like they pay for themselves in hard-wearing durability and lower-back health from reduced bending too! Even rot-resistant (expensive) wood like cedar for making a raised bed is only intended to last for about 10 years. And, you have to admit - these galvanized raised beds look fantastic! 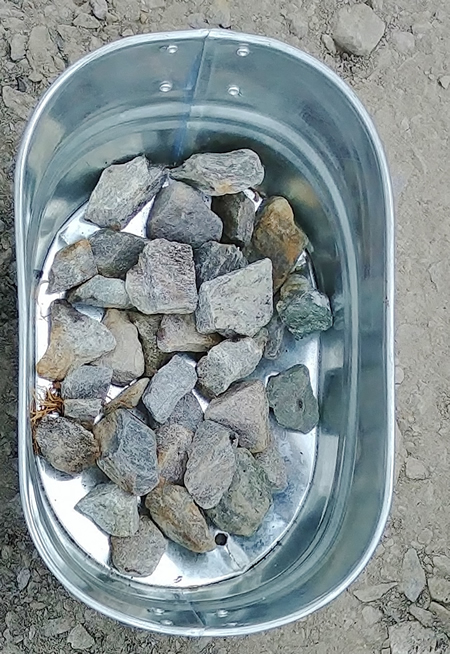 After drainage holes are drilled in the bottom of your galvanized planter, line the bottom of the planter with a few inches of small stones or wood chips to make draining easier. When placing large planting bins, take the time to make sure they are level, which is important for drainage. Try creating level ground with a foundation of cinder blocks or using stones. Use cinder blocks or stone to elevate your galvanized planter to the right height. A foundation of stone, bricks or wood will give your container better drainage than if placed directly on the ground. 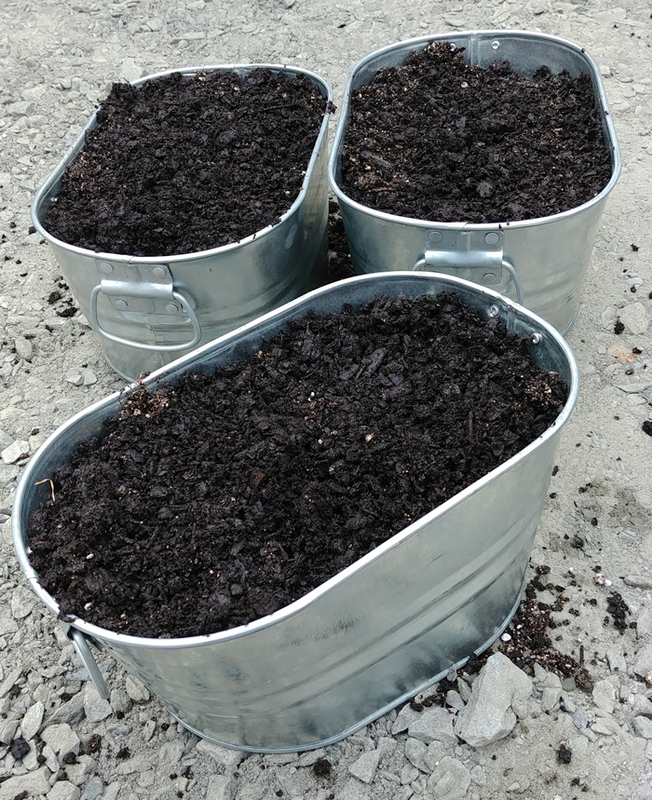 Don't forget that once large containers are full of soil they are heavy and become relatively permanent. So place them where they belong and make sure they are level before filling with soil: they get heavy! To move them you will probably have to empty them. Related: is your galvanized steel leaching toxins into your food? 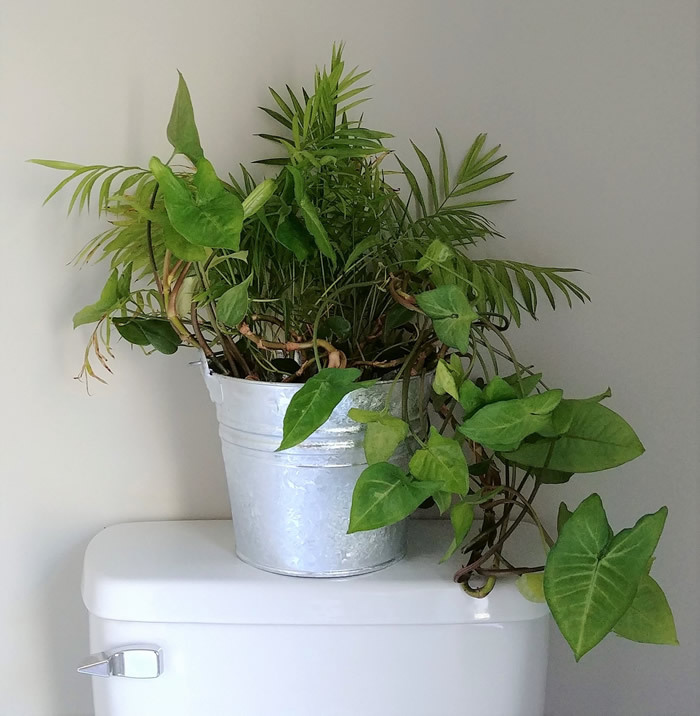 How to plant in a galvanized tub? 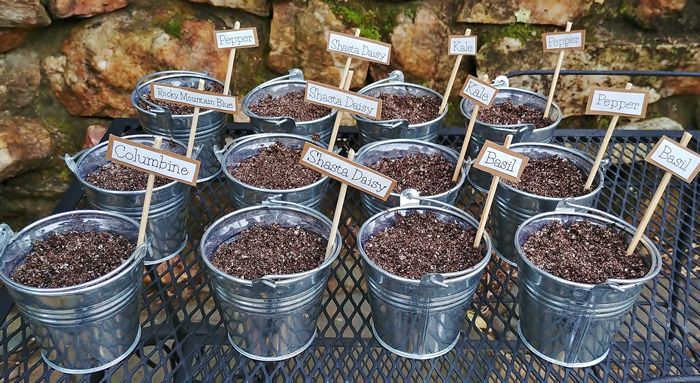 For container garden planting, experts recommend the thriller, filler and spiller method. Thriller is the garden's centerpiece and it should be something big, bold or bright. Select filler plants that grow 6-8 inches tall in colors and textures that complement the thriller centerpiece plant. 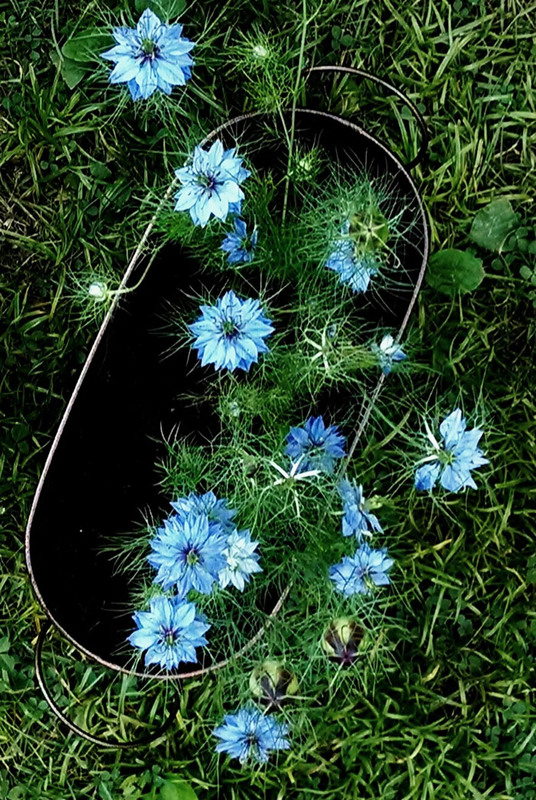 Spillers are low-growing plants that spill over the edge of your galvanized wash tub planter. Remember the plants chosen for your containers will depend on the location of your garden and exposure to the sun. For spots that recieve 8 hours or more of sunlight plants chosen should require full sun exposure. For sites that receive less than 8 hours of sun, plants that need partial shade should be chosen. 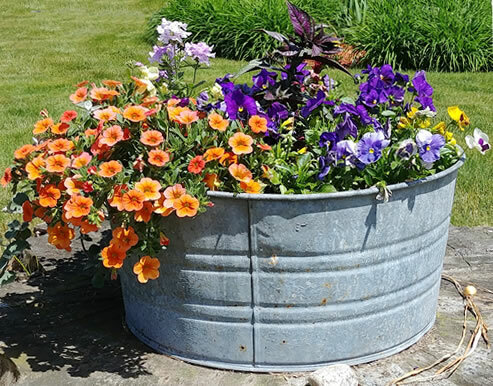 Plants in galvanized containers need frequent watering - even daily - during hot, dry weather, but do not overwater them. If the top 1 inch of soil feels dry the soil should be watered. Water should be administered thoroughly and should drain from the holes in the bottom.